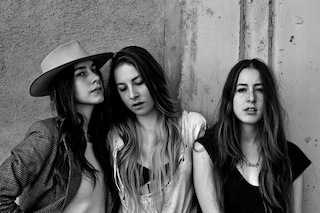 Haim have started work on their new album. The trio is back in the studio working on the follow-up to the well-received Days Are Gone, and they're teaming up again with the producer Ariel Rechtshaid. Este Haim let fans in on the secret when she posted a picture from her Twitter account of Reichstaid at work, along with the caption "Here we go again". A poster of David Bowie looms large over the producer, who has also worked with the likes of Vampire Weekend and Sky Ferreira, and MNEK, the London songwriter who teamed-up on Disclosure's album.